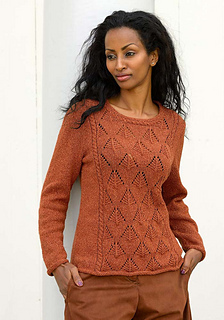 This sweater features a lace pattern framed with cables. The lace pattern is easy and straight forward to knit, the shape is classical, only accented by a cable around the neck. The garment is shown in size small with two inches of ease.